The Foundation's MS Office Plugin installs as a common add-on for Word. 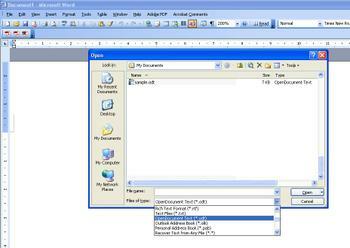 It permits the user to open a text document within the Word application in the OpenDocument Format (.odt). Plugins for Excel and Powerpoint are also proposed and in development. This screenshot comes from the OpenDocument Foundation's response to the Commonwealth's Request for Information. Fig. 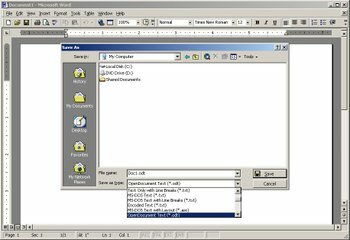 1: (Word 2003) File->Open wizard now includes the .odt extension as if it were one of Microsoft's own formats (click image to expand). The user may work within Word in the .odt format and later perform a File->Save (or File->Save As) in the .odt format, transparently, with no required change in the customary way of working. The user or administrator may also set .odt as the default file format for Word (more screenshots available soon).